This stairway is custom built to customer specifications. 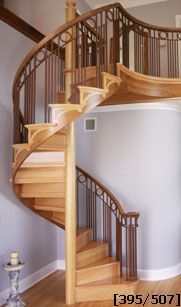 The center column and treads are made of red oak wood, the stair stringer and handrail are made out walnut and the stair and balcony balusters made from steel. The handrail is # 237 (2 3/4" x 2 3/8") molded walnut that runs continuous from the stair to the balcony rail. The balusters are a # 312 (1/2" square) with 1/2" square bar rolled into round rings at the top and spaced to a custom design specified by the customer. Wood treads are a # 142 (1 1/2") thick red oak with a nosing and a red oak close riser. The custom made stringer and landing is 2" thick walnut with a special cut on the stringer at the riser and run. The stair has a custom decorative red oak bracket on the side of the stringer and the center column is 6" diameter solid red oak.